This is a stunning rendition of fall colours that emotes vibrancy and depth. 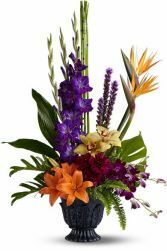 Purple gladiolas, orange lilies, purple orchids, and birds of paradise sends your best sentiments with grandeur. An arrangement as fun and vibrant as she is. 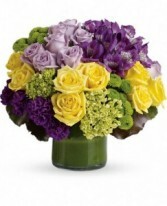 This modern and lush design features yellow roses from Ecuador, purple local stock flower, moon edition carnations in purple, and hydrangea. 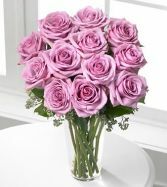 An enchanting bouquet of lavender roses sweetly touches her heart. 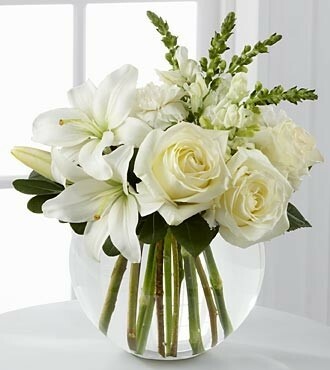 Paired with seeded eucalyptus in a stylish glass vase, these lovely roses are a perfect gift. Better has 17 roses, Best has 24 roses. All roses are premium long stem roses from Ecuador.